Or, What I Don't Want to Know About The Boys Trip. Mr. Outdoors is 6 hours into his annual trip. He's entertaining me with an iPhone journey of photographs. There will be others who join he and Dr. Chaos for , food, , drinking, , camping, and general y-chromosome comraderie. I can only imagine what else will come my way before Sunday. This is the truck as they left town (Do you see it there? Toward the back? Yeah, that. The kitchen sink. Remember, they also have an X chromosome). Clearly, there is not enough food in all those bins in the back. RELOAD! More chips, cookies and beer! And firewood. To roast those wild rabbits they are going to hunt, skin and eat for the protein part of the food pyramid. Dr. Chaos is feeling better already, now that he's gotten back in touch with his Inner Redneck. 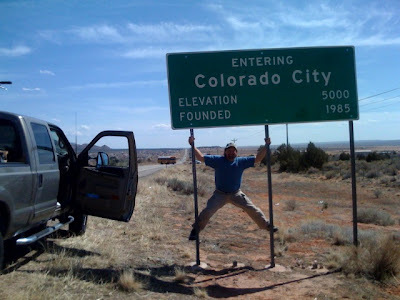 And, just because no adventure is complete without side trips to local attractions, there was a visit to Colorado City. Home of Warren Jeffs and his wacky world of polygamy. No way, guys. Trust me when I say that ONE WIFE IS ENOUGH FOR EACH OF YOU. You & Z are lucky. DJ wouldn't even bother to TRY to take pictures! 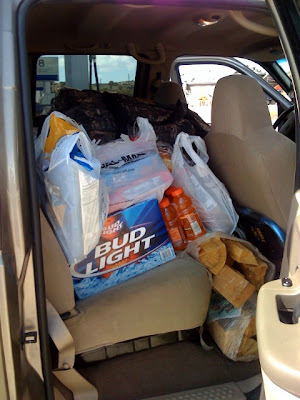 That looks like my kind of weekend (Pizza, Beer & Camping) but if I were to tag along, I'd need better beer. Definitely need to upgrade the beer! oh to be a fly on the wall of the tent. well, maybe not. still, the blackmail you could use when needed. Is that Spiderman in the last pic?! Z - Mr. Outdoors is an engineer. Lazy? No. Annoyingly meticulous? Yep. AM2B - with ya, sista. Microbrews for me. dkaye - I have a tent story to tell about these two. Watch for it! April - SHHHH! I'm using the payback for leverage! BHoppin' all the way! Tootsie - I'm just all shiggery that you stopped by! You're my idol! 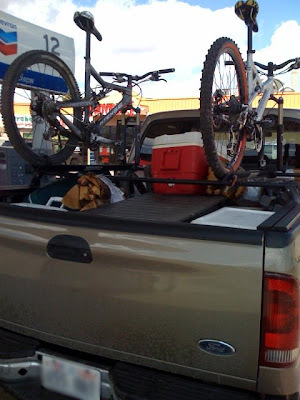 Beer to chug, wood to burn, pizza to scarf and bikes to provide alibis. Yup, the perfect men's getaway.